Knowing a little bit about the story of Bi Bim Bap (both the food and the restaurant) made an already awesome dining experience even more pleasant. We showed up and were escorted to our table by our VERY friendly server who brought us hot tea and menus. The menu is extremely simple: several appetizers and several different kinds of Bi Bim Bap. We ordered the jap chae and crunchy wasabi salad (which was totally unnecessary, since the bi bim bap was quite enough to be satisfying). However, both were delicious, and the wasabi salad was fresh, crunchy, and interesting. We ordered the Traditional and Korean BBQ Bi Bim Bap. I chose the sour sauce, whereas my dining companion took the traditional. The Bi Bim Bap came steaming steaming steaming in a hot stone bowl straight from Korea. The presentation was lovely, with a perfect fried egg and shreds of nori crowning the top, and the vegetables underneath were perfectly cooked. After the meal, we were brought a special cinnamon ginger dessert drink with pine nuts and apricot- unexpected and refreshing. Throughout the whole experience our friendly server was attentive to anything we could need, explaining the dishes without prompting and constantly pouring us tea. Just when we thought it couldn’t get any better, all the tables were brought special kim chi pancakes: one every month or two, when they are down to the last of the kim chi package, they use the leftover juice to make pancakes to share with everyone. This is good luck. Good luck for us, for sure! Overall a fun, tasty, and pleasant night out. This one is now a favourite! 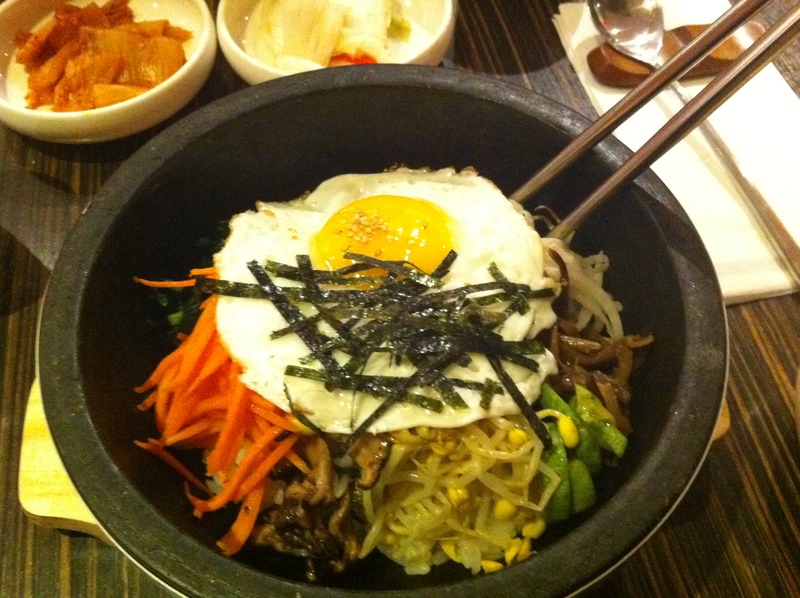 This entry was posted in Dine Under $50, Korean, Recommended and tagged bibimbap, jap chae, kimchi. Bookmark the permalink.